When it comes to law enforcement and social media there are basically two kinds of stories. The first and more frequent type usually runs with a headline like “Police officer fired because he thought there was a privacy setting on Facebook.” But the second type is the kind of thing that guarantees smiles, back patting and cost-effective public relations. For instance, two Portland police officers recently completed a pizza delivery after a delivery driver was injured in a crash police responded to. 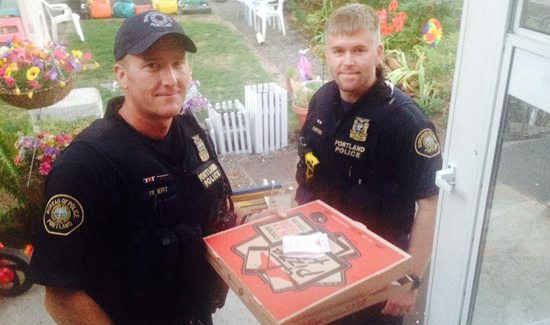 Steve Huckins told KOIN 6 he couldn’t believe his eyes when two uniformed cops arrived at his door with the pizza. Huckins later shared the photo with Portland Police Bureau spokesman Pete Simpson. The Portland Police Twitter account then posted the photo. Since then it’s gone totally viral with millions of views. That’s how you use so-called “social media.” By keeping in mind the fact that Facebook, Twitter and all the rest are in fact broadcast technologies and using them strategically and effectively. Oh yeah – doctors say the delivery guy from the accident is going to be fine. Use image I sent earlier with Twitter info below identifying officers.